Online CE on this Page is accredited by the Commission on Accreditation for Prehospital Continuing Education (CAPCE). The cost of online CE is $2.95 per hour. Upon completion of the course, you will be issued a certificate from EMS University, LLC, good for CE credit through the NREMT. Additionally CAPCE is accepted for CE hours in MOST states. Check with your state EMS Authority for further information regarding CE Hours. ONLINE NREMT REFRESHER (CAPCE F5 APPROVED) COURSE - 24 HOURS. This 24 hour course includes topics identified by the NREMT, necessary to recertify under Section II of the NREMT recertification brochure. This course is approved by the Commission on Accreditation for Prehospital Continuing Education (CAPCE). The class also follows the U.S. Department of Transportation (DOT) National Standard Curriculum for Emergency Medical Technician Refresher. Students who successfully pass the course, will be presented with a certificate outlining the applicable topic areas. This course cannot be used to verify skills competency. 24.0 Hours of Continuing Education (24.0 CEU) provided upon successful completion. EMS University, LLC is accredited by CAPCE to offer CEU Hours. This course details the Preparatory section of topics for which the EMT is responsible for knowing. Preparatory content is essential so that the EMT has a good basis of understanding the introductory topics surrounding the EMS system. 5.0 Hours of Continuing Education (5.0 CEU) provided upon successful completion. EMS University, LLC is accredited by CAPCE to offer CEU Hours. This course details the Airway Management section of topics for which the EMT is responsible for knowing. Airway Management is at the core of the EMTs skills knowledgebase. This course will help the EMT better understand and review topics related to the skills. It will also provide information on the NREMT examinations for Oxygen Administration and BVM of an Adult Apneic Patient. 2.0 Hours of Continuing Education (2.0 CEU) provided upon successful completion. EMS University, LLC is accredited by CAPCE to offer CEU Hours. This course details the Patient Assessment section of topics for which the EMT is responsible for knowing. Patient assessment is perhaps the most important part of being a good EMT. Without good patient assessment skills, which encompass communications, documentation, examination techniques, etc… the EMT is largely ineffectual. The primary design of this course is to improve the EMTs patient assessment skills. This course will help the EMT better understand and review topics related to these skills. It will also provide information on the NREMT examinations for Patient Medical and Trauma Assessments. 5.0 Hours of Continuing Education (5.0 CEU) provided upon successful completion. EMS University, LLC is accredited by CAPCE to offer CEU Hours. This course details the Medical Emergencies section of topics for which the EMT is responsible for knowing. A good understanding of Medical Emergencies is required to be able to perform efficiently and function properly as an EMT. This section details the following subtopics: pharmacology, respiratory, cardiac, neurological, seizures, anaphylaxis, poisoning/overdose, environmental, and behavioral emergencies. This course will help the EMT better understand and review related skills and topics. It will also provide information on the NREMT examinations for Patient Medical Assessment and Cardiac Arrest Management/AED. 8.0 Hours of Continuing Education (8.0 CEU) provided upon successful completion. 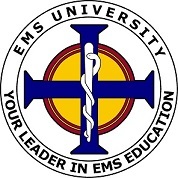 EMS University, LLC is accredited by CAP to offer CEU Hours. This course details the Trauma Emergencies section of topics for which the EMT is responsible for knowing. A good understanding of Trauma Emergencies is required to be able to perform efficiently and function properly as an EMT. This section details the following subtopics: bleeding & shock, soft tissue injuries, musculoskeletal injuries, and head/spinal injures. This course will help the EMT better understand and review related skills and topics. It will also provide information on the NREMT examinations for Patient Trauma Assessment, Spinal Immobilization (Seated & Supine), and Long Bone and Joint Immobilization. 6.0 Hours of Continuing Education (6.0 CEU) provided upon successful completion. EMS University, LLC is accredited by CAPCE to offer CEU Hours. This course details the OBGYN, Neonatal, Infant, & Pediatric Emergencies section of topics for which the EMT is responsible for knowing. A good understanding of this section is required to be able to perform efficiently and function properly as an EMT. This section details the following subtopics: OBGYN, neonatal, infant, & pediatric assessment and management. This course will help the EMT better understand and review related skills and topics. 5.0 Hours of Continuing Education (5.0 CEU) provided upon successful completion. EMS University, LLC is accredited by CAPCE to offer CEU Hours. This course details Advanced Life Support (ALS) Assist for the EMT. It is important that the EMT have a good working knowledge of what to expect from working with a Paramedic partner. A good understanding of this section is required to be able to perform efficiently and function properly as an EMT. This section details the following subtopics: Assisting with IV administration, EKG placement, advanced airway management, ALS medication administration, ventilators, and other quasi-BLS airway devices. This course will help the EMT better understand and review related skills and topics. 2.0 Hours of Continuing Education (2.0 CEU) provided upon successful completion. EMS University, LLC is accredited by CAPCE to offer CEU Hours.